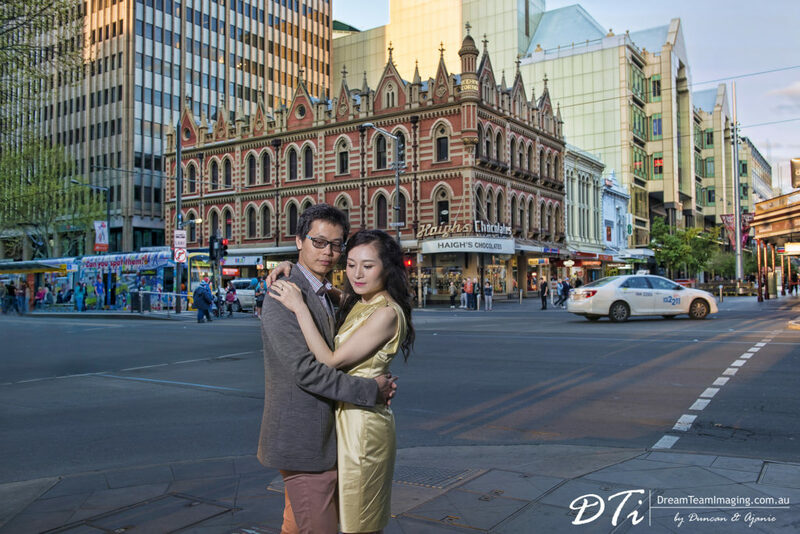 Adelaide city CBD offers many locations for photographing couples. 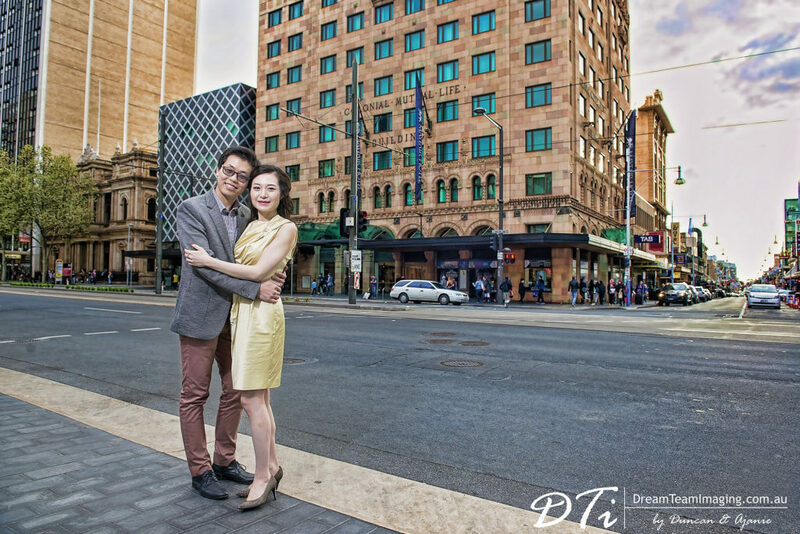 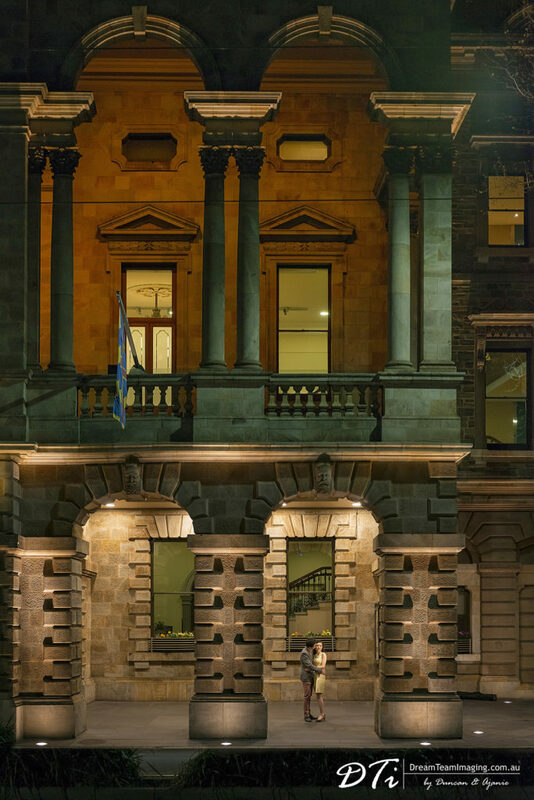 The rich blend of historical and modern architecture adds so much of background detail to any image. When we plan for a pre-wedding shoot one of first things we do is to find out from the couple what type of environment is the most comfortable for them. 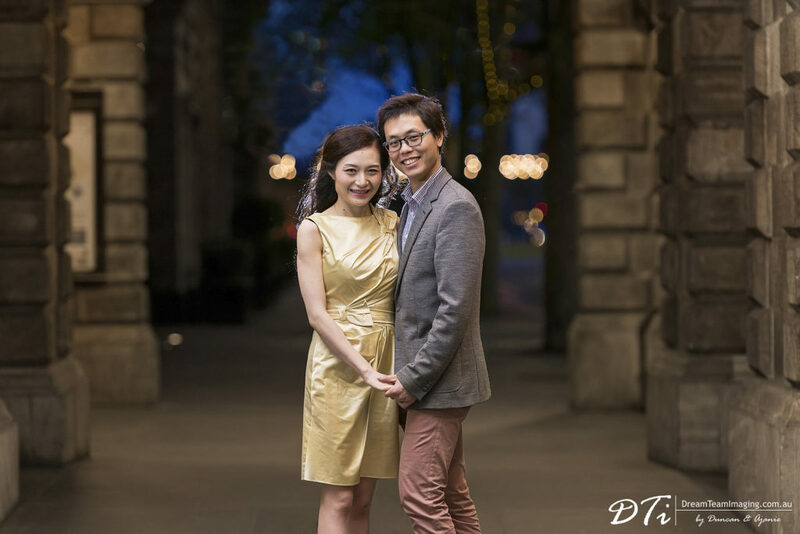 This is quite important as the pre-wedding shoot is an opportunity for us and the couple to get to know each other as well as for the couple to get comfortable being in front of the camera. 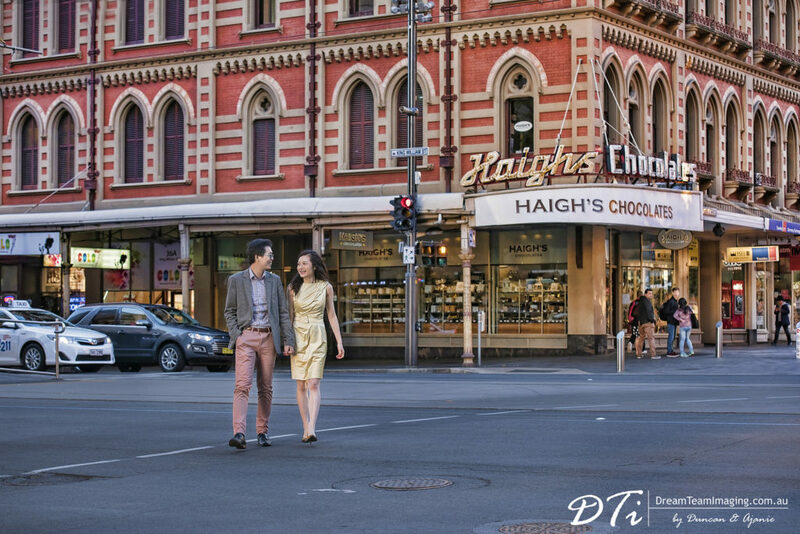 In the case of Liu & Hang, they wanted the Adelaide city CBD’s beauty showcased as the backdrop. 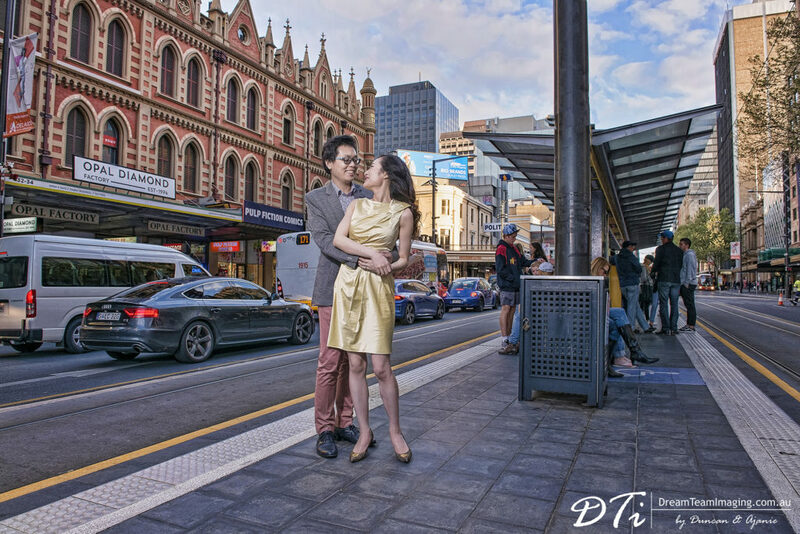 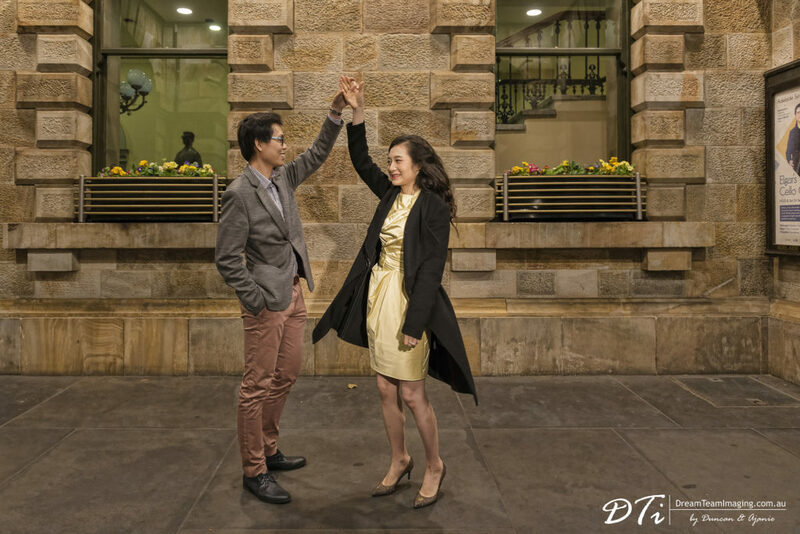 There are many iconic locations Adelaide city offers, but considering the time available to us, we chose to meet at Rundle mall and walk up King William street making frequent stops along the way to photograph our beautiful couple. 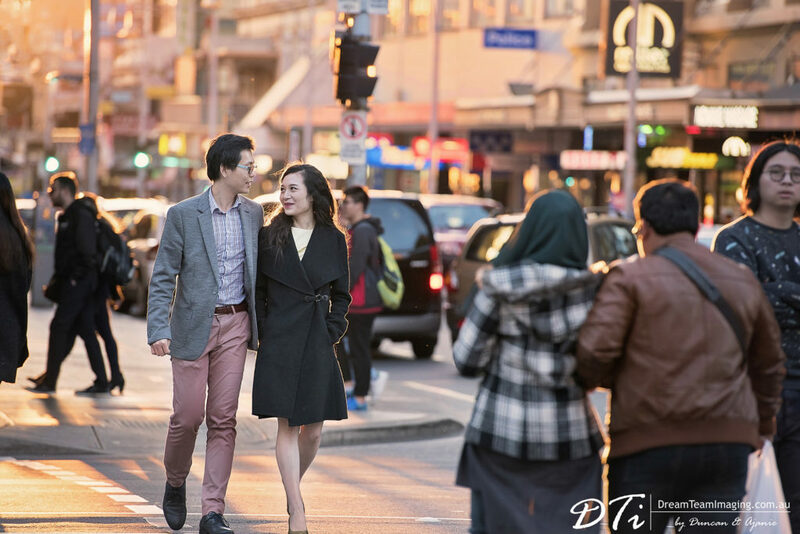 One of the advantages of being in a smaller city is the ease of getting from one location to another without having to travel long distances in traffic. 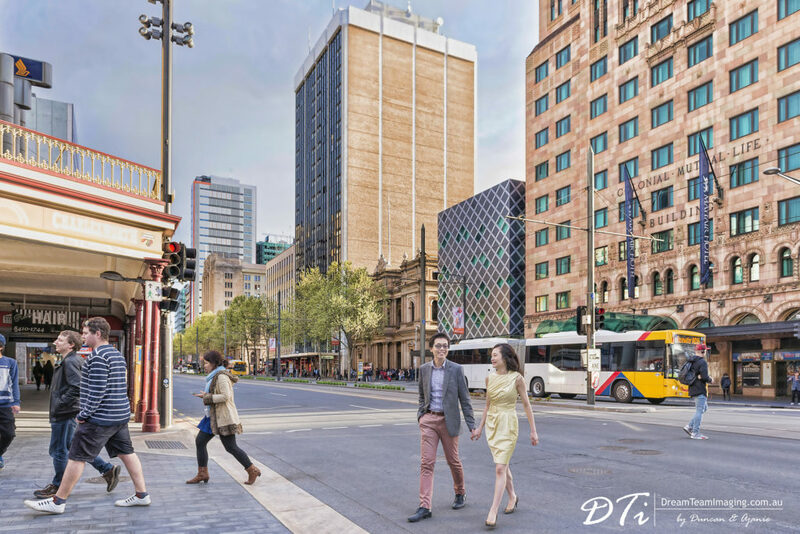 Adelaide city offers exactly this. 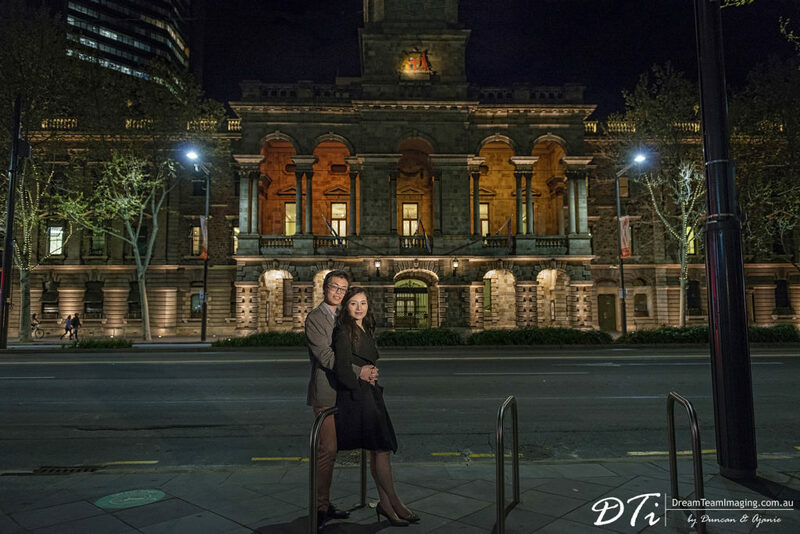 Liu & Hang wanted some night photography done as well, so we started the shoot closer to 5pm. 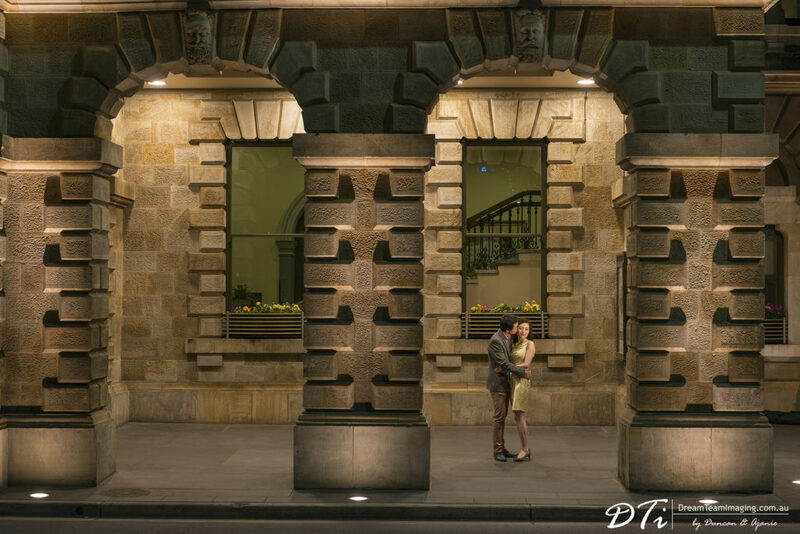 This gave us the opportunity to do some late afternoon photography whilst there was sun light still available before the evening set in. 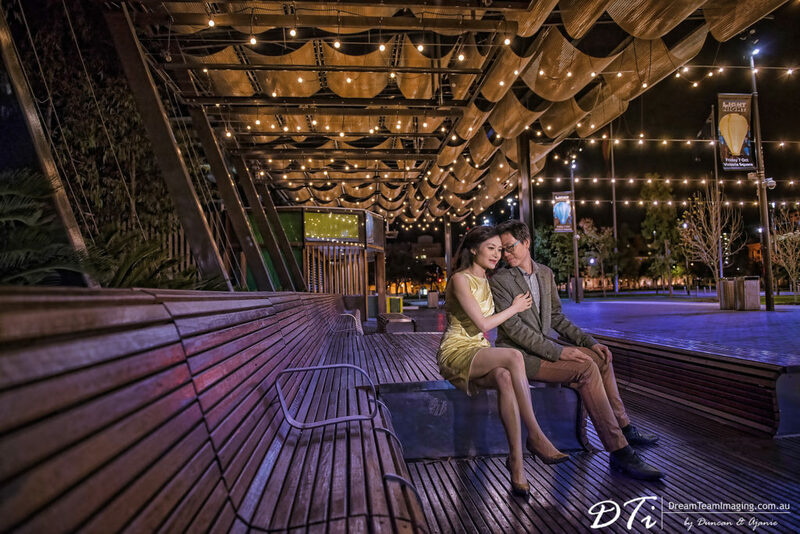 We both love night photography as this offers a whole new world of creative opportunities. 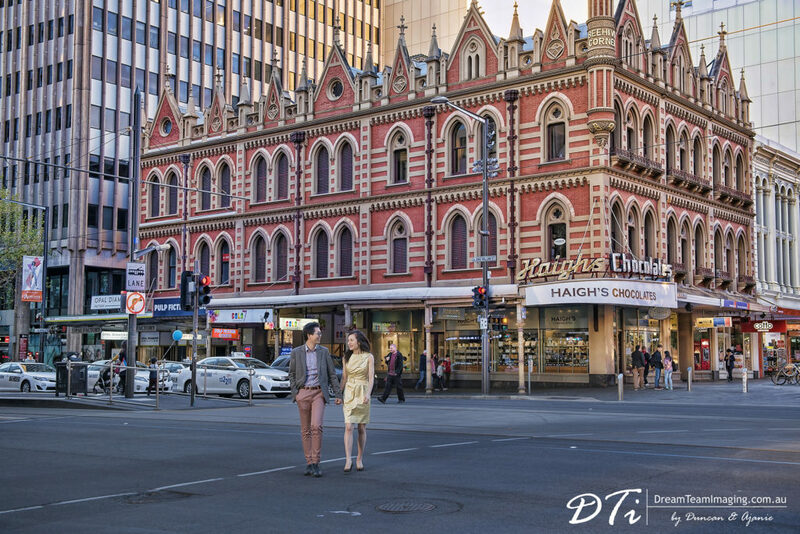 Here too Adelaide city offers so many different colour hues to work with. 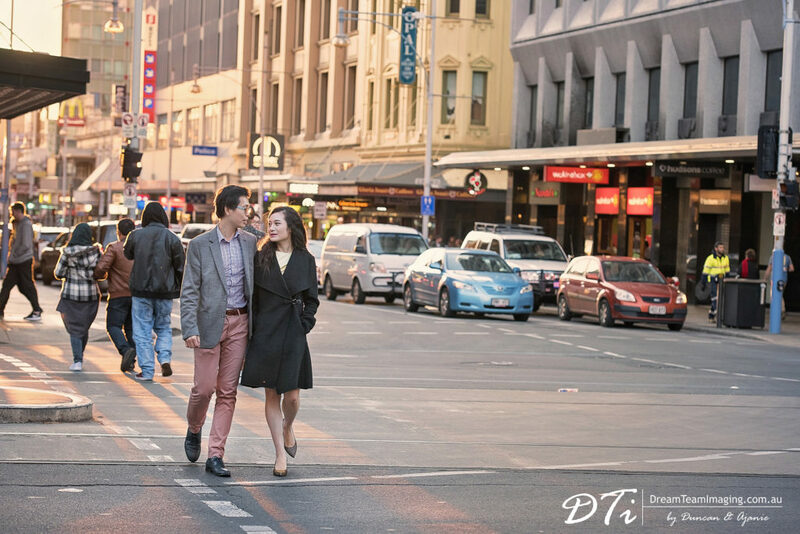 Colours generated by the street lights, lights from the many different buildings and also the passing by cars, busses and trams. 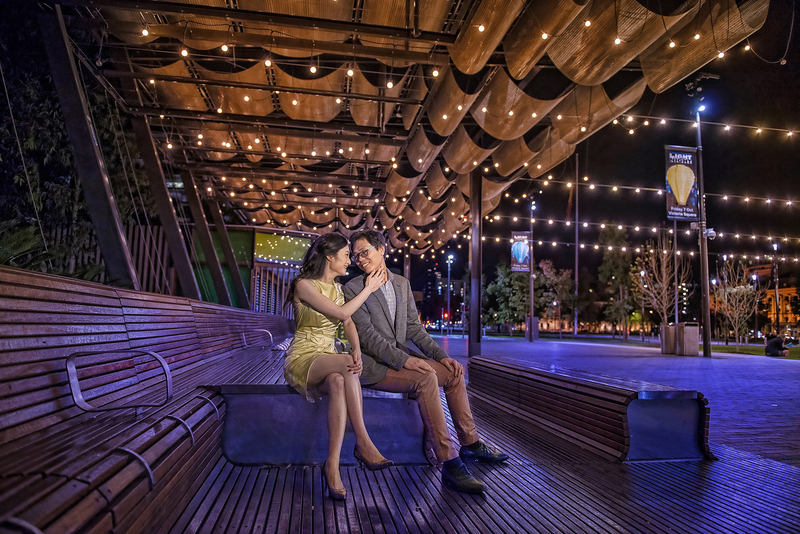 We worked our way up King William street and eventually ended up at Victoria Square where the many different colourful lights and overhangs made for great moody imagery. 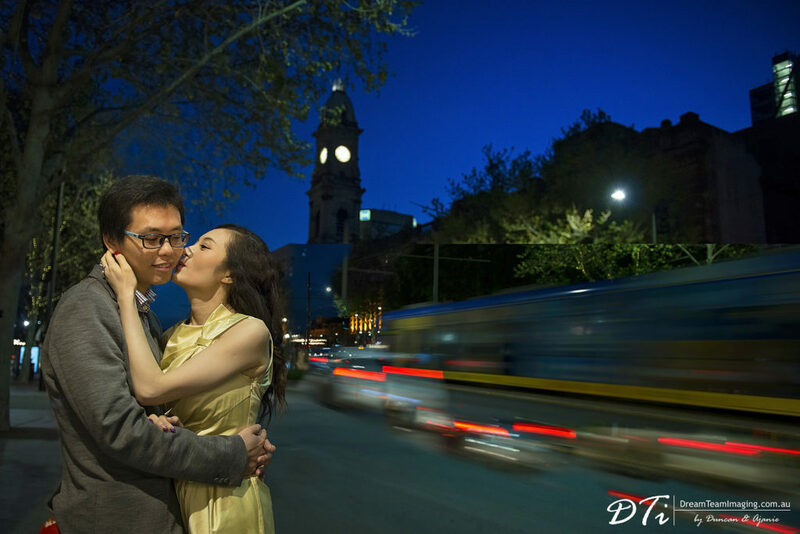 Kudos to Liu & Hang for braving the chilli winter weather. 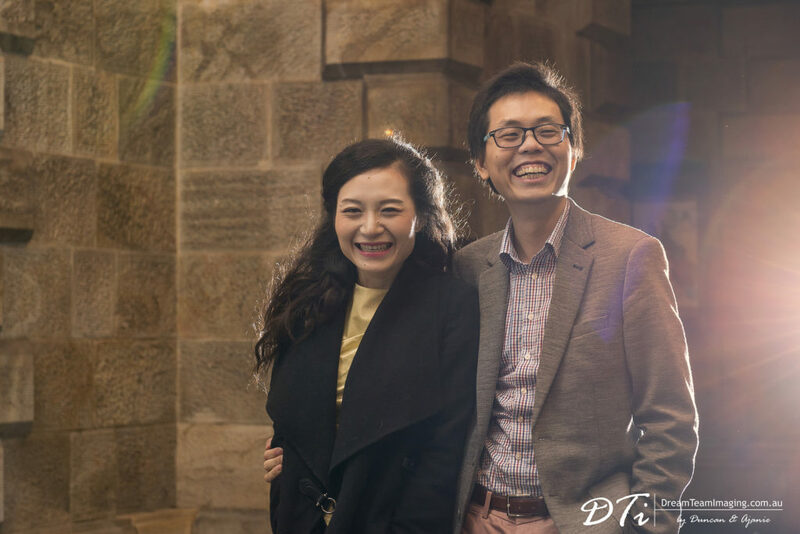 We can not wait for the wedding day so we can spend more time with them.